Hiya guys! Are your wallets feeling the shopping pain yet? I know mine has been. My wallet is actually holding out a little 'rip' sign as we speak. It's been mostly online shopping because I am all about those indie sales. It's the one time of year where I feel my collection ends up doubling up in a weekend, haha. 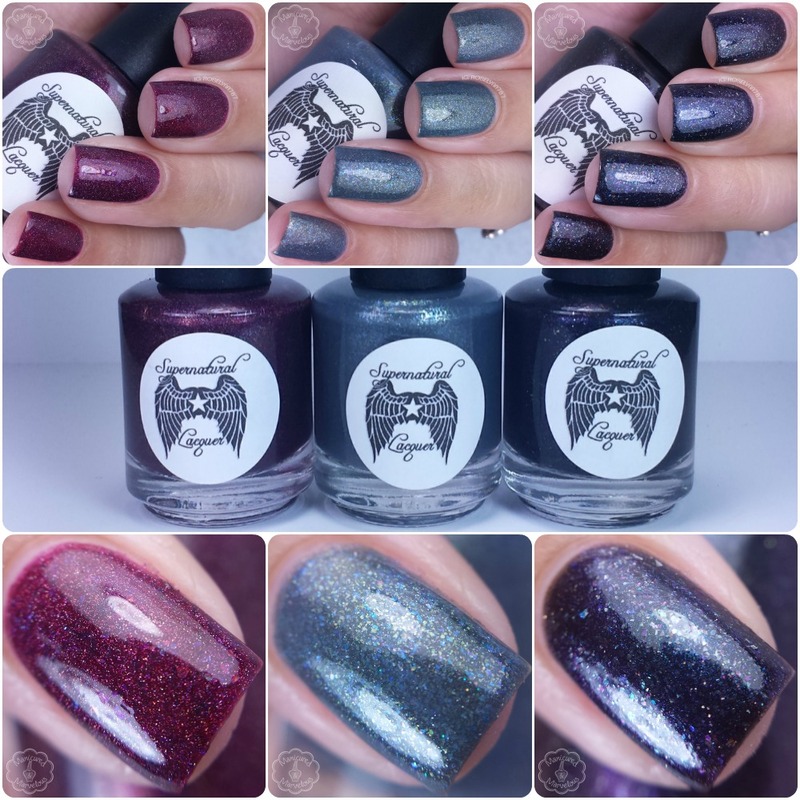 Today I'm sharing the brand new Yuletide Monsters Trio from Supernatural Lacquer. This holiday trio is inspired by legends of Christmas monsters. You guys are going to love these! The Yuletide Monsters Trio by Supernatural Lacquer will be releasing tonight November 27th at 8PM EST. Each polish will retail for $10.00 each for a full-size bottle. 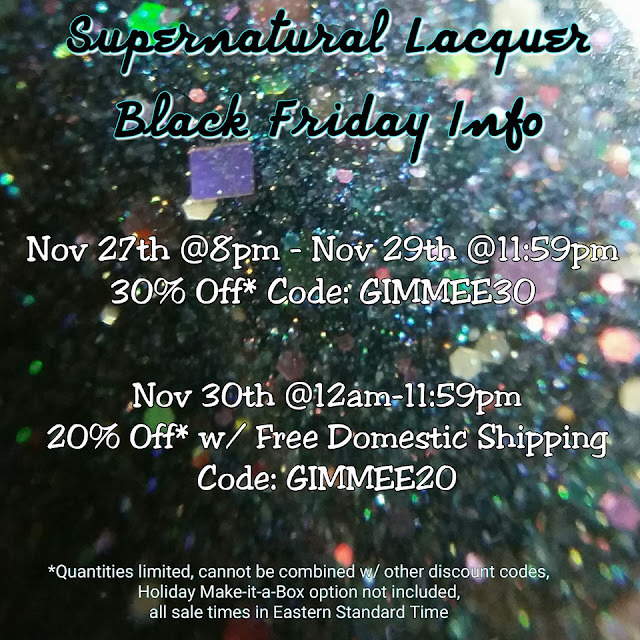 Supernatural Lacquer's Black Friday starts tonight, details at the bottom of my post. 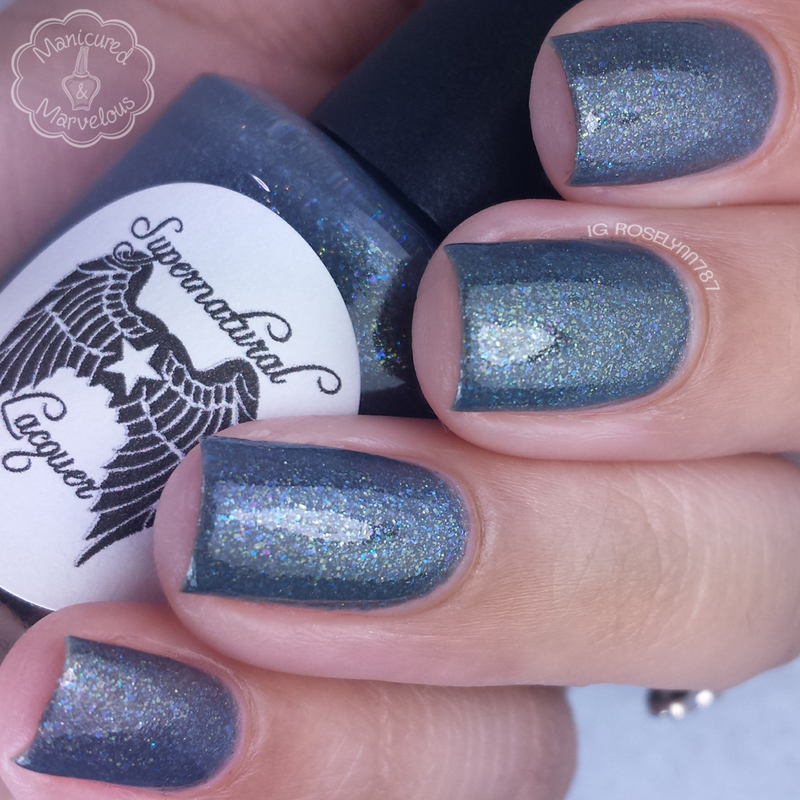 Belsnickel can be described as a medium gray crelly packed with blue, white and gold shimmer and micro flakes. Whenever I see a gray polish in a collection I always get excited because it's such an unrated shade. This one is particular is absolutely gorgeous, I love the depth that the flakes give to the finish. Formula was a little bit sheer and on the thin side, but it ends up evening out well on its own. You could probably get away with two coats, but I needed a third to get a completely opaque finish. The finish dries a bit matte and on the gritty side on its own. Shown here is three coats sealed with a glossy topcoat. 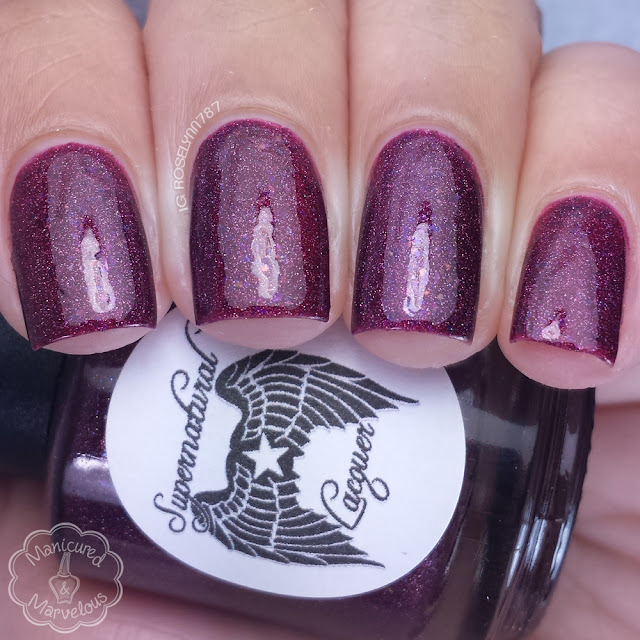 Krampus can be described as a burgundy holo jelly with midnight black micro flakes. One of my favorite tones to wear during the holiday season. So festive and eye-catching as well. The formula and consistency are great, not too thick or too thin. It's also a really opaque polish with almost full coverage in one coat. The finish has some nice natural shine on its own. Shown here is two coats sealed with a glossy topcoat. Yule Cat can be described as a black crelly base with purple and rainbow micro flakes with a subtle purple/red shifting shimmer. Look at all those flakies *drool* haha. I mentioned the other day about how much I love rainbow glitters and flakies with a black base and then boom here she is. The flakies in particular definitely make it stand out against other similar polishes. The formula is similar to the others in this trio, smooth application with no issues. The finish does dry a bit gritty due to the almost of glitter and flakies, but a topcoat smooths it all down nicely. Shown here is two coats sealed with a glossy topcoat. Overall I love this fun and unique trio for the holiday season. The Yuletide Monsters Trio by Supernatural Lacquer is very different than everything else you're used to seeing this time of year. The quirkiness behind this brand is definitely something that has always appealed to me as a huge fan of Supernatural the show. Which is what makes it so beautiful and a must-have trio to own in my opinion. But tell me, what do you guys think about the inspiration behind these beauties? As I mentioned before, this trio along with a bunch more will be releasing tonight at 8PM EST. And, of course, there are also awesome Black Friday deals to go along with all the new releases. The finish on these is mesmerizing, you captured each little flakie so well! I really enjoyed this trio. My fav was Belsnickle. Beautiful swatches! Oh, these are gorgeous! I especially love Belsnickel. I don't think I could pick a fav! They are all gorgeous! I love the polish. It's so strange that both this brand and Lemming Lacquer released collections about scary Christmas stuff on the same day (even the same names). Oh geez these are lovely! Right?! No wonder they sold out so quickly. I can't pick a favorite! I love all three of these! Loooove these!! They are all gorgeous! These are stunning! Krampus is my favorite. I'm pretty sure there's a movie coming out (if it hasn't come out already) based off of Krampus too. Lol. Wow! The red one is stunning! Perfect for Christmas!